I’m posting this as it came to me today from Rafael Uzcátegui. Given the nature of a group letter, the statistics seem to me to be conservative, but the statement and intentions are clear. We, the organizations and people who defend human rights, activists and promoters of Non-Violence and Peace, conscientious objectors and anti-militarists, who take action in Venezuela, address this open letter to our friends throughout the world, sharing our opinion about the conflict which is currently unfolding in our country. We know that the decrease in the causes of violence are intimately connected with the dignity of the lives of people. There cannot be conditions of dignity and peace if there is not a decrease in poverty, hunger, inequality, and improvements in the access to basic goods and services for the entire population, especially for the most vulnerable sectors. Violence flourishes in societies without democratic guarantees for participation in free and fair elections to elect representatives and powers. There is no way to promote non-violence and peace if we ignore the causes of discrimination and inequality which have forced millions of people to migrate. To promote non-violence and peace we must advance in the elimination of the exercise of Power from the logic of authoritarianism, unequivocal and militaristic which poses relations between people from the perspective of enemies, friends, allies, and traitors which seek to eliminate – both symbolically and in reality – difference and liberty. Venezuela has been experiencing an accelerated process of significant setbacks to our quality of life, making it harder to access the most basic things which are necessary for subsistence, and deeply affecting the democratic system. Since 2015, after the election of the National Assembly, it was evident that the pro-government political sector had lost its majority, and elections began being manipulated to guarantee that Maduro’s party (PSUV) remained in power. The government does not publish official data and disregards and criminalizes studies and testimonies which reflect a reality contrary to what is shown in the national media, which is fiercely monitored and censored. The Office of the High Commissioner of Human Rights of the United Nations reported that 3.5 million Venezuelans had been forced to migrate in the past years. Venezuela suffers a Complex Humanitarian Emergency generated by political decisions, not by natural disasters or armed conflicts. The State is responsible for inflicting damage and has demonstrated that it has no will to repair the damages it has made. In 2018, poverty rates reached approximately 48% of households, according to the three main universities of the country. Inflation reached 1,229,724% and, according to projections, could reach 10 million % in 2019. A single family needs 60 monthly minimum wages to acquire the basic goods and services necessary to survive. In 2017, 64% of Venezuelans lost approximately 11 kilograms of weight and 33% of children between 0-2 years of age suffer delays in their process of growth and development. In a study conducted by Caritas, 53% of Venezuelan households has had to recur to survival strategies such as begging and searching for food in the trash. In 2018, non-governmental organizations reported that 60% of the medical attention that existed in 2011 had disappeared and, according to official data, the maternal mortality rate increased by 66% and child mortality rate by 30%. Since 2017, more than 79,000 people with HIV stopped receiving anti-retroviral medicine. Venezuela has the highest growth rate of malaria cases in the world, adding 43% to the cases of malaria in Latin America. Just in 2018, the cases of malaria increased by 53%. There is an alarming health crisis given the resurgence of eradicated diseases such as tuberculosis (10,952 cases), diphtheria (9,362 cases), and small pox, which has caused the death of at least 5,000 people. This resurgence has been caused by the lack of access to medicine and the lack of prevention and control programs. The Pharmaceutical Federation of Venezuela reported that in 2018, the scarcity of medicine reached 85%. The deficit of beds available in hospitals reaches 64%, 79% of hospitals do not have running water, 53% of operating rooms have closed, and 95% of medicine, medical supplies, equipment, and pieces to repair broken down machines are imported. In 2017, the Supreme Court of Justice tried to annul the National Assembly through a decree, which the Prosecutor General, Luisa Ortega Díaz, declared as a “rupture of the constitutional order”. Consequently, Venezuela has experienced the largest cycle of peaceful protests in contemporary Latin American history, along with Nicaragua. Millions of people have taken to the streets asking for free and credible elections, the respect for the constitutional order, the separation of powers and the rule of law. 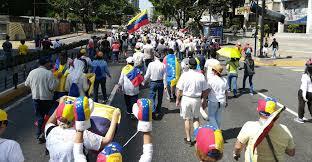 The internal democratic means to change the situation have been blocked, the population engaged in marches, blocked streets, organized walks, petitions, artistic direct action, hunger strikes, referendums and dialogues. The response has been the implementation of a repressive military plan called “Plan Zamora”, with the participation of security forces, the National Bolivarian Guard, and armed civilians. According to non-government organizations, there were 6,729 protests in 4 months across the country, 135 people murdered, more than 12 thousand people detained, 848 political prisoners, and over 230 victims of torture, cruel and unusual punishment, and millions in exile. The result has been a systematic persecution against the political dissidence which has generated the opening of a preliminary examination by the International Criminal Court for crimes against humanity. Nicolas Maduro violated the Constitution by calling for a National Constituent Assembly, with supra-constitutional powers, declaring a state of emergency to govern without a balance of powers with the legislative body, with which he brought the date of the presidential elections forward, without the minimum conditions of fair elections for Venezuelans to choose a president freely. This is how, in 2018, Maduro was re-elected for another 6-year term, in a political event that was not just, transparent, free, or credible, as evidenced by the United Nations, the Organization of American States, and 60 countries throughout the world, also denounced by the Venezuelan human rights movement. During 2018, after the people’s struggle for the restitution of democracy was defeated, and with the worsening of the Complex Humanitarian Emergency, Venezuela had the largest index of forced migration which the region has witnessed. According to the United Nations High Commissioner for Refugees, over 3 million Venezuelans have fled the country and, if the situation does not significantly change in 2019, this number could increase to 5 million people. The protests in Venezuela have not ceased. In 2018, there were a total of 12,715 protests, which amount to 35 protests daily throughout the country, of which 89% were associated to social or labor demands, the provision of basic services, health and food-related. In this context, 14 people were murdered, 13 by fire arms. In 2017 the Fuerza de Acciones Especiales (FAES) police force was created with the purpose of conducting a social cleansing campaign in the popular barrios, they also committed arbitrary detentions, forced entries, and extrajudicial executions. According to the human rights organization, Provea, FAES has murdered at least 205 people. On January 10th, Nicolás Maduro proclaimed himself president for a second period, violating the national Constitution and installing a de facto government. The National Assembly, on January 23rd, being the only institution legitimately elected by popular vote, basing their mandate on the Constitution, declared that the Presidency had been usurped and thus assumed the powers of the executive body to create a transitional government which would permit free and credible elections in the short-term. Since January 21st, a new cycle of mass protests began, with the popular sectors as their protagonist, as the neighbors of the barrio of Cotiza protested in the streets demanding an end to the usurpation of the Presidency after a nearby military garrison declared their non-recognition of Maduro has the president. The neighbors’ protest was repressed by security forces, led by FAES. Between January 21st and February 4th 2019, a total of 35 people were murdered in protests, 9 were extrajudicially executed in cases of forced entry after the protests ended for the day. There have been 939 arrests, amongst them hundreds of women, 77 teenagers, and 7 indigenous people. The political, humanitarian, and migratory crises in Venezuela are a problem for the region. Countries of various ideological positions have expressed their concern for years, and the current situation had become a crucial moment for the future of the country and the region. The 13 countries most populated and most affected countries by the Venezuelan migratory phenomenon created a coalition called the Lima Group, who have recognized the National Assembly, recognized Juan Guiadó as interim president, support the call for new elections, specifically through a peaceful transition without the use of force. Additionally, 21 countries in the European Union have joined the called for free and credible elections, stopping the exercise of a de facto government by Nicolás Maduro, and the recognition of the rightful exercise of executive powers by the President of the National Assembly, Juan Guaidó. The European community has called on the creation of a commission to last for three months to create credible elections in Venezuela. Mexico and Uruguay have proposed a dialogue to create a peaceful exit to the crisis. Colombia and Brazil, countries which share borders with Venezuela, have been heavily affected by the border and migratory crises, and have support the Lima Group’s resolutions, offering to assist with the provision of humanitarian assistance at the border. The United States of America have taken the more belligerent posture amidst the crisis, creating pressure towards a transition as proposed by the Lima Group but, in the case of failure, considering every other option on the table, including a military option. The declarations by the United States government have generated a comprehensible global reaction. Unfortunately, the reaction has not been to avoid a war due to the tragedy which that would represent for the Venezuelan people and the region, also supporting the peaceful exit of Maduro from power so that the Venezuelan people can freely express their will. The reaction posed the conflict as one of Maduro and Venezuelan socialism versus Yankee imperialism. This reaction, by amplifying the Venezuelan government’s propaganda, commits a great act of injustice against the people who suffer amidst a complex humanitarian emergency, who cannot exercise their liberties, and of whom the majority want a political change. If we want to talk about imperialism in Venezuela we must tell the whole truth. Our country continues being an exporter of petroleum, and the United States continues being a main commercial partner along with China and Russia, which has created significant deals between the Russian oil company Rosneft and the Venezuelan oil company Pdsva which are not public information. Additionally, since 2016, Maduro released a presidential decree which allowed for large-scale mining in the Arco Minero del Orinoco, an area of 111,843.70 km2 – 12.2% of the Venezuelan territory and an area of land larger than Portugal – divided in four blocks for the extraction of gold, diamonds, coltan, and other minerals. This is the area with the most drinking water in the country, it is indigenous lands, and there have been no environmental impact studies or prior, free, and informed consent to the projects, and the National Assembly has not approved the projects, a legal requirement per the national Constitution. The land has been militarized with important negative consequences with the increase in mafia activity, slave-like conditions, sexual exploitation, environmental damage, a negative cultural on indigenous communities who have been transformed, along with campesinos, into miners, along with massacres and disappearances of miners. The public complaints, the possibility of one of the worse ecocides in the region, and the violation of environmental and social rights have been silenced by activists throughout the world. Turkey, China, Canada, Russia and various other African countries are the most interested and active in the exploration and exploitation of mines in the Arco Minero. We must add that Russia has become the great arms trafficker to Venezuela. Rosoboronexport, the large-scale Russian arms exporter, announced in 2018 that it would reactivate joint work with the Maduro government in the construction and opening of an Kalashnikov gun factory in 2019, which had been delayed for years due to corruption issues. Starting in 2016, the Maduro government, became a military government with limited civilian support. Venezuelan military officials, committed to military sectarianism, without any form of public accountability, currently occupy the most important positions in the purchase, importation, and distribution of the markets tied to the complex humanitarian emergency, along with a significant number of Ministries, governor’s offices, state and private companies, banks, etc. In an investigation conducted by Transparency Venezuela, in 2018, 12 ministries and 6 state governments were under the leadership of military officials. The national production and distribution of basic foods, those which are most scarce and which are most speculated upon in black markets are in control by military officials: oil, rice, sugar, beef, coffee, black beans, personal hygiene products, pharmaceutical goods, diary, corn, corn flour, margarine, toilet paper, women’s hygiene products, diapers, pork, wheat, and soy. Members of the Armed Forces coordinate the 9 main wholesale markets for the distribution of foods throughout the country, along with the management of airports and national ports. There are military companies in the areas of banking, finance, agriculture, communications, oil, mining, education, health, life insurance, industry, construction, and contracting. The country is governed and at the mercy of the military, including their logic and permanent war propaganda. Venezuela, for over two decades, has experienced the logic of war which has divided Venezuelans. This has been a process of polarization that has been in transformation with the passing of the years and which today places people at two extremes: those who defend democracy and those who seek to maintain power through authoritarian means: violating the Constitution and confiscating the autonomy of independent powers, manipulating elections so they do not truly represent the will of the people. Defending a military dictatorship with a civilian head of state, similar to that of Alberto Fujimori’s in Perú, against the majority of the population who seek a peaceful solution in which the voice of the Venezuelan people can be expressed through free and credible elections, so we can choose our destiny. Nicolás Maduro has blocked every peaceful means for the restitution of democracy, the constitutional order, and the gravely needed attention for the complex humanitarian emergency. It has ignored and criminalized critical voices, including those who identify with chavismo who publicly criticize Maduro’s exercise of power. What is happening in Venezuela today is not a case of imperialism versus a legitimate government of a socialist cut. It is a constitutional and peaceful route which the people are choosing in order to have a return of democracy. We do not want a forceful military intervention, we do not want more death or pain, we urge the entire world to not ignore the clamor of the Venezuelan people. We can stop a war, we can stop a military intervention, if every unites inside and outside of our borders, raising our voice with us, demanding that it is the people, through truly free and democratic elections, who sovereignly decide our destiny. The Venezuelan conflict has two solutions: a peaceful one, returning to the constitutional order which today is violated by a de facto government through free and credible elections. The second option is through force, whether through the action of the Venezuelan military against the governing elites or through an armed intervention by a foreign military. It depends on every single one of us and our actions to place enough pressure so that the solution we face is non-violent, and inclusive, with the democracy and justice which the Venezuelan people and humanity itself deserves. We want it to be our voices and aspirations, not arms, which finally decide the future and destiny of our country. But for that, we need your help.